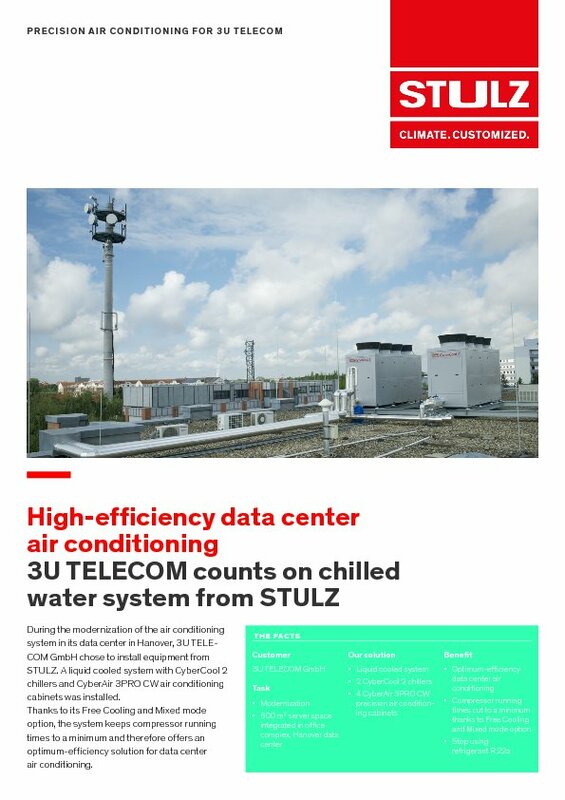 During the modernization of the air conditioning system in its data center in Hanover, 3U TELECOM GmbH chose to install equipment from STULZ. A liquid cooled system with CyberCool 2 chillers and CyberAir 3PRO CW air conditioning cabinets was installed. Thanks to its Free Cooling and Mixed mode option, the system keeps compressor running times to a minimum and therefore offers an optimum-efficiency solution for data center air conditioning. 3U TELECOM GmbH, subsidiary of listed company 3U HOLDING AG, has been active in the field of telecommunications for over 15 years and is a pioneer in the modern telecommunications landscape. Its portfolio has developed continuously over the years, and today its original landline telephone and network infrastructure products are joined by data center services such as colocation, cloud computing, virtualization, network transmission services, plus building and infrastructural management. To achieve this, 3U TELECOM boasts four data centers of its own in Berlin, Hanover, Marburg and Frankfurt/Main. 3U TELECOM took over the Hanover data center in 2013. It offers 600 square meters of server space and is integrated in an office complex. However, at the time the company took over, its efficiency was no longer up to date. 3U TELECOM therefore decided to completely modernize it, with the aim of achieving a Tier II standard in accordance with TIA-942 (Telecommunications Infrastructure Standard for Data Centers) from the American Uptime Institute. As part of these renovations, the existing data center air conditioning also had to be replaced, as it still used the now prohibited refrigerant R22a. In order to meet the Tier II criteria, the new air conditioning solution had to have a redundant structure (N+1 redundancy). Further requirements were high energy efficiency and optimum adaptation to structural features. The data center was to be kept in operation during the replacement, and work in the neighboring offices should be affected as little as possible. It should also allow for problem-free installation of a second expansion stage at any time. AxiTop fan diffuser attachments provide additional noise reduction. 3U TELECOM decided to install a liquid cooled system consisting of two STULZ CyberCool 2 chillers with Indirect Free Cooling each with a cooling capacity of 100 kW, and four STULZ CyberAir 3PRO CW precision air conditioning cabinets each with a cooling capacity of 33 kW. The chillers were sited on the roof of the four-story office building. Since the CyberCool 2 chillers feature an encapsulated compressor chamber and their fans have a large surface area to ensure especially quiet operation, sound insulation was not required for the chillers, especially since 3U TELECOM decided to install AxiTop fan diffuser attachments. These attachments, which STULZ provides as an optional extra to the standard fans, further reduces noise and also increases fan efficiency. The STULZ CyberCool 2 chillers feature Free Cooling coils with large surface areas. In order to exploit the energy-saving Free Cooling function to the full, the operating point was set to 18 °C (chilled water inlet) and 12 °C (chilled water outlet). If Free Cooling is no longer sufficient on its own, initially the system switches to flexible Mixed mode consisting of Free Cooling and compressor cooling. In this mode, the STULZ CyberCool 2 uses the Free Cooling coil to pre-cool the chilled water, thereby curbing the power consumption of the variable-speed scroll compressors. As Free Cooling capacity falls the compressor speed increases. However, compressors only reach their maximum power consumption when the Free Cooling function has become completely ineffective. In this way, energy-intensive compressor use can be reduced to a minimum. Based on the average temperatures at the data center site in Hanover, 25 % of cooling can be attributed purely to Free Cooling, around 58 % to flexible Mixed mode, and only about 17 % to compressor cooling. An intelligent control system determines when the STULZ CyberCool 2 should work in Free Cooling, Mixed or compressor mode and to what extent – e. g. in Mixed mode – the scroll compressors should come into play. It makes sure that the most efficient operating mode for the current outdoor temperature is selected, and also monitors the parallel operation of both chillers. By regulating the speed of all components, such as pumps and EC fans, based on heat load, it therefore enables especially energy-saving operation. The control software can be individualized for each specific project, and additionally supports all common building services management system protocols. Consequently, the STULZ CyberCool 2 can be integrated in building automation systems without problem at any time. Since data centers have to be air conditioned around the clock regardless of season, the use of optimum-efficiency precision air conditioning systems is a worthwhile investment. And this also applies to the 3U TELECOM data center in Hanover: with intelligent and performance optimizing mode options, the STULZ chillers used here ensure maximum-efficiency cooling. Furthermore, N+1 redundancy guarantees reliable, fail-safe operation. The installation of a third chiller and two more precision air conditioning cabinets is planned for the future. In anticipation of this extension, the Ketrix® pipes of the air conditioning system already have the right diameters and the appropriate outlets.